Accueil Produits Bande originale La bande originale de “Snake eyes”. Sortie : 4 août 1998. Julia’s Story #1 – 1:23. Tyler and Serena – 4:37. Kevin Cleans Up – 2:13. You Know Him – 2:19. Blood on the Medals – 2:02. Crawling to Julia – 3:24. 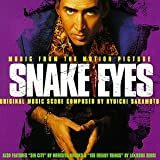 Snake Eyes (Long Version) – 7:39. Sin City (Meredith Brooks) – 4:16. The Freaky Things (LaKiesha Berri) – 3:35.